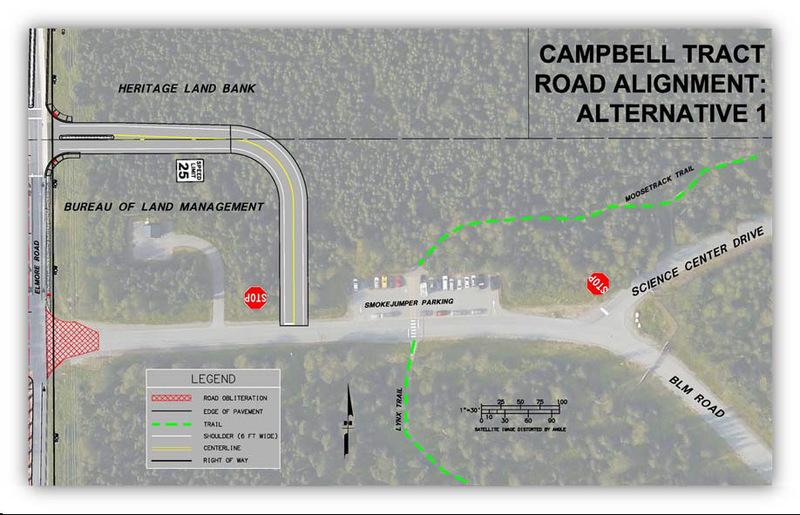 Western Federal Lands Highway Division (WFLHD) and Bureau of Land Management (BLM) in cooperation with The Alaska Department of Transportation and Public Facilities (DOT&PF) proposes to realign the Campbell Tract Facility (CTF) BLM Road with the existing signalized intersection at Elmore Road and East 68th Avenue in the Municipality of Anchorage (MOA). The purpose of this project is to improve pedestrian and intermodal connectivity as well as operational safety when accessing the CTF. 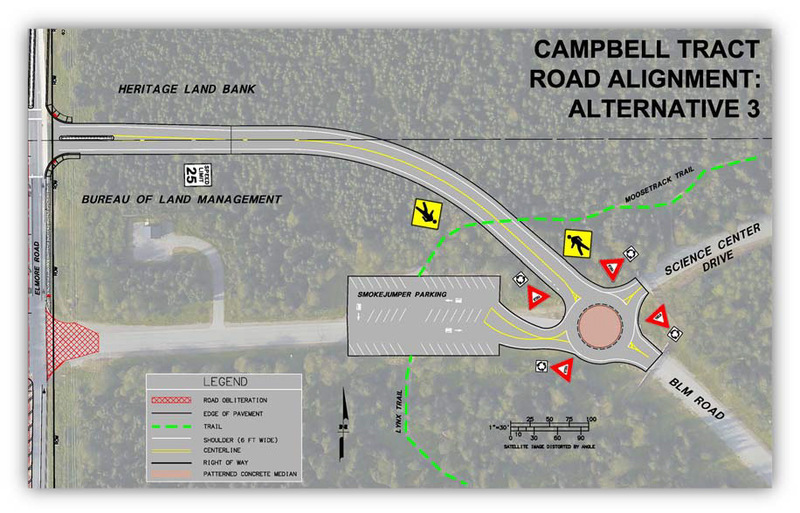 The proposed project will include constructing a fourth approach to the existing intersection at Elmore Road and East 68th Avenue and realignment of BLM Road from this intersection to an internal junction on the Campbell Tract Facility. Topsoil and seed all disturbed areas once construction is complete. Four alternatives for the BLM Road realignment were considered. All project alternatives besides the No‐Build option will include the reconstruction of the signal at East 68th Avenue and Elmore Road. Alternative two (2) is the preferred alternative by BLM. Alt 2: Ties the realigned BLM Road in at the existing wye intersection. 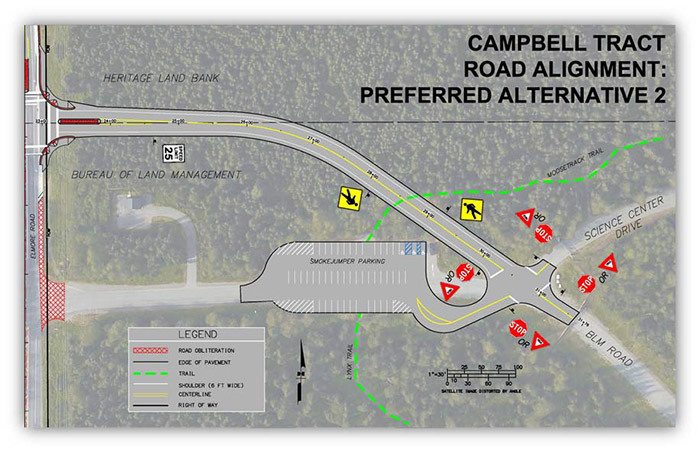 Alt 3: Has a similar alignment as Alt 2, but would include a mini roundabout for the internal intersection. Alternative 2 was selected by BLM, see below. The Plans, Specifications, and Estimate (PS&E) package are currently being developed. Plans In Hand (PIH) 65% design was completed May 2018 and is available under the Documents link located under Project Information. Please contact the project team anytime with questions, concerns, comments or compliments.